Field ready to quickly measure a sensor, save data, and communicate results with custom PDF reports and spreadsheet output. VWA measurements are geolocated with an integrated GPS, allowing the device to verify and provide guidance to sensor locations. The VWA uses spectral-analysis technology (VSPECTTM) to provide the best vibrating-wire measurement possible while disregarding external noise. The large color display offers an easy-to-view graphical presentation of the data. 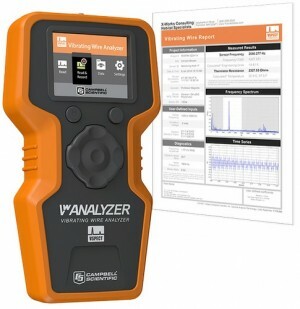 The Vibrating-Wire Analyzer (VWA) uses patented VSPECTTM technology for the most reliable vibrating-wire measurements available. The VWA converts measurements to engineering units, generates a printable PDF report, and saves a CSV summary file. The graphical display allows confirmation of sensor output and operation. VSPECTTM technology eliminates disruptive noise interference and provides sensor diagnostics for the best measurement possible. VSPECTTM noise immunity allows gages that are otherwise unreadable to be evaluated with confidence. A Project File maintains Site/Sensor information for 40 unique sites with 22 sensors per site. Site/Sensor locations are geolocated, allowing the internal GPS to guide a user directly to a sensor location. Site/Sensor and user information can be created or edited on the device or with a computer using the free VwProjects software. Note: The VWA can be connected to a computer and is treated like an external memory device (flash memory drive) to transfer data.